(12:45 p.m. EDT) -- Hip cruisers will be able to be get inked during their vacation at sea thanks to a new partnership between Virgin Voyages and World Famous Tattoo Ink. The cruise line's Scarlet Lady, which launches in 2020, will feature a tattoo studio called Squid Ink, with two resident tattoo artists and a lineup of guest artists. When Scarlet Lady sets sail, it will have two full-time resident tattoo artists onboard, both handpicked by Lou Rubino Jr., the tattoo industry legend behind World Famous Tattoo Ink (a vegan-based ink brand), Soho Ink in New York City and Freshly Inked Magazine. All Squid Ink tattoos will be created using vegan ink from World Famous Tattoo Ink. "The World Famous Tattoo Ink family has been working with sailors, pirates and rock stars for more than 50 years," said Rubino Jr., owner of World Famous Tattoo Ink. 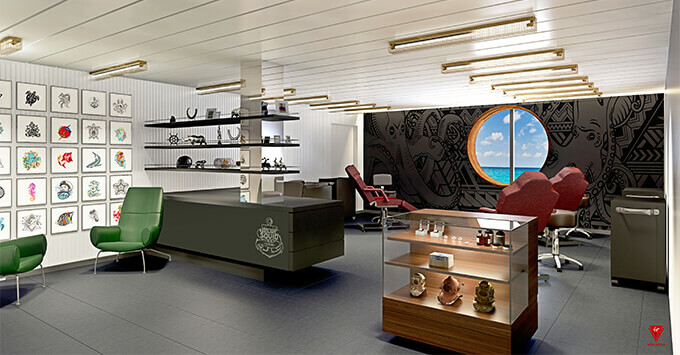 "As global acceptance of tattoos and body art continues to grow, partnering with Virgin Voyages gives us the unique opportunity to bring color to places people might have never thought possible before." In addition to its resident artists, Squid Ink will feature a lineup of guest artists, including the likes of Spike TV's "Ink Master" star Sarah Miller, surrealist specialist Arlo DiCristina and the illustrative specialist Jime Litwalk. The studio will feature a selection of exclusive voyage tattoo designs. Squid Ink will also offer body piercings, as well as permanent makeup treatments. Virgin Voyages, which can only be sailed by those 18 or over, will also encourage its crewmembers to get tattoos. Scheduled for delivery in 2020, Scarlet Lady will sail from Miami and feature a "Vitamin Sea" concept, which focuses on passenger wellness, relaxation and fun. Public spaces including a fitness center, spa, salon, bar and nightclub will be positioned so that passengers can easily move between them to detox by working out or having a spa treatment and then, subsequently, "retox" with a drink or two and a night of dancing. Learn more about the new ship, including what you can expect with entertainment and accommodations.